Laruaville 5 is rated 4.2 out of 5 by 25. Rated 5 out of 5 by CAVEGRL from Bad Match 3 Yep, this game is bad, bad, bad! I'm getting nothing else done! LOVE IT!! Rated 5 out of 5 by leanraw from Great game Please bring us more games like this one. Rated 5 out of 5 by 1955raven from GHOSTLY FUN!!! THE LITTLE GHOST ARE BACK AN AS FUNNY AS EVER! STRANDED ON AN ISLAND, THE QUEST TO LEAVE THE ISLAND IS A BIT MORE DIFFICULT HOWEVER WITH NEW CHALLENGES! BUT STILL A BARREL OF FUN! Rated 5 out of 5 by Kafinkee from Fun & Challenging Just finished the demo and came back to buy. It can be hard to find a Match3 that's challenging enough and lots of fun to play. I'm not a big fan of the Barbapapa-like characters in the Laruaville series which are likely more appealing to children along with the story/graphics but the M3 boards are far from childish. Not so difficult that it becomes frustrating (based on demo only and previous game in series). This one has some new twists that I liked and I'm itching to progress and discover more. If you're an M3 fan, I highly recommend you give this game a try. Rated 5 out of 5 by a41249 from Hey Matey Another installment of Laruaville to add to my collection. This game is harder than the other ones but it is not impossible. More challenging rounds to attain the coins but once you get the hang of it ,its not to bad.Great M3 game . This one is a keeper. Try it and you might agree with me. 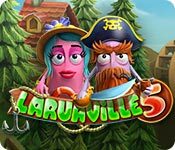 Rated 5 out of 5 by pennmom36 from Laruaville Is A Fantastic Match 3 Series But They Aren't Easy Two of our friendly ghosts from Laruaville have been stranded on a deserted island after an unexpected storm tore their boat to shreds. Luckily, the mainland is in sight, all they need to do is build a boat. For whatever reason, they need money to do so, and the only way to get money is to play a Match 3 game, Laruaville style. The story starts out with the two ghosts on an island, the only reason I know what happened is because I read the BF introductory, so either I missed part of the story or the devs left a lot up to imagination as to how or why they got there. This isn't an easy breezy Match 3 game, but there are three modes to choose from, Relaxed, Limited Time or Limited Moves. Keep this in mind when playing this game, it's all about the coins, don't worry about obstacles UNLESS they are standing in the way of getting to a coin. Coins are collected when you make at least a Match 3 adjacent to them, beside them, over them and directly below them. You want to try to match at least 4 tiles to receive a pack of dynamite, or other power-up, because many of the obstacles require a power-up to destroy it in order to progress. Some Coins are in half, requiring matches next to them to make the halves come together in a straight line. Eventually there are Dirty coins that need a power up to clean, Icy coins that require fire, coin molds to fill with Gold to create coins, Vials that need filled, and coins with Locks and keys that need joined, along with obstacles such as Ground, Clay, Stones, Fire, Ice, Fog, Rocks, Shielded Crates (require matches on unshielded sides to destroy) and even Bugs! The coins will help the ghost get to the mainland eventually, and each item you buy usually comes with a new powerup. 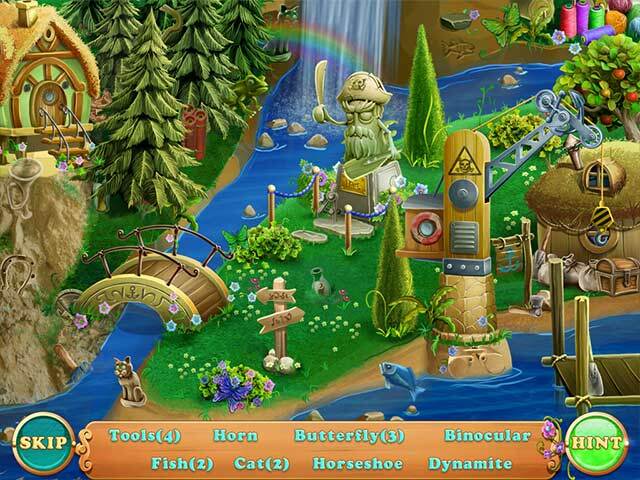 After a few levels you get to play various types of Mini Games such as Spot The Difference, Solitaire or a Hidden Object Scene, so get your Match 3 game on and enjoy! Rated 4 out of 5 by cowclaudia from Same old Laruaville I have all six of these games and like them only on this one was bombarded with bombs which tho helpful at times were constantly getting in the way, you still get the 24/25 score which made it longer to build something so wish they would "up the ante" so to speak and wish they would have a skip for some of the mini games. I like the cards not find the difference in panels. Other than that the game is cheerful and colorful, love the music and keeping the fire going is a real challenge which I like. Rated 4 out of 5 by Pollysweet from A Crazy, Fun Game I have all the Laruaville Games for MAC. This has to be the best one. Minimal instructions and you're on your own. Very few hints, which seem to decrease as the game moves along. I'm not done with it yet but I love it. Rated 4 out of 5 by eugene1980 from We love it :) Very nice game for my kids. Amazing grafics and sound fx. Have a fun! Rated 3 out of 5 by bessiegirl from Not as good as the others in this series I have all 5 of this very exciting and challenging match 3 series, however, this one is my least favorite. In the other games, you can collect gold coins in the puzzles...not this one, so it got to the point I just skipped them to keep the game moving along. There are a lot of card games, which are more difficult than the other games in this series, so no gold? Why frustrate myself. The HOS and find the difference puzzles are a challenge too. This series is not for the faint of heart, there is so much going on and you have to keep alert and strategize. Fun games. I still think the little ghosts are a bit funky though. Rated 2 out of 5 by AverageSizeFish from Dismal - the soundtrack alone is hair-pulling I bought this game because it seemed to have the mechanics of other games by this developer in their Cursed House series. Unfortunately, I hated the music so much I had to turn it off (which I almost never do). Gameplay was marred by the fact that every match turns tiles into dynamite, clogging up the board. This ruined any enjoyment I could squeeze out of the game. The small jelly-bean-like characters are ugly, and any element of the game featuring them seemed more appropriate for a child than an adult. 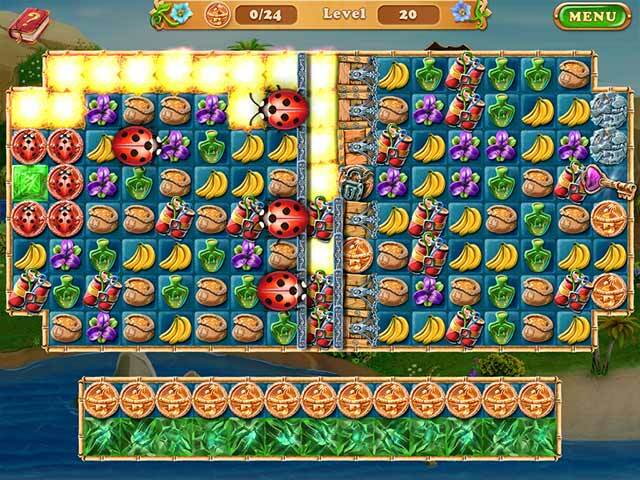 In Cursed House you are up against evil demons and scarabs. They kept the same idea of quashing but instead you're smashing cute little ladybugs which made no sense to me at all. Overall, this game is just a completely garbled mess combined with a terrible soundtrack and stupid cartoonish characters that even most kids would hate. Dismal. I'm sorry I paid for this train-wreck. Rated 2 out of 5 by Spookys_Mom from Why so many Bombs? Sorry, I own all 4 of the Laruaville games that came before this one and was excited when I saw today's game. That quickly turned into "What have they done to this Game?". It is impossible to play because every time you make a play a bomb is created. There are bombs every where. You cannot make matches because all the bombs are in the way. Then you have to concentrate on making more bombs so you can get three in a row to clear them. Basically this game is matching the bombs so you can move on. Love the other games. This one "not so much". You may have a different opinion. Of course, as always, try the demo and decide for yourself. It's Free! Rated 1 out of 5 by mygames33 from All the previous Laruaville were great except this one I was so happy to see Laruaville 5 because I loved the first 4, so I bought this one immediately, unfortunately this is terrible. They have made it way too challenging to finish a round, with too many obstacles to clear a field. The credits they give for each very challenging round are really low, so you have to do several loooong rounds to build anything. The buildings graphics are not even as cute as the originals. I'm very disappointed with this game. I like to play these types of games to relax not to be frustrated! Unlike the first 4, this game is not fun at all! Rated 1 out of 5 by emollie26 from Wasted my money with this one! As I have the others, in the series, I thought this would as good, if not, better than the previous 4. I did play the demo, first. That was ok, so I bought it. Big mistake! Huge! As soon as I started playing, the game just got worse, and worse. Where's the match 3's? Where's the challenge? Where's the fun? All I seemed to be doing, was matching 3 bombs! Some levels, I couldn't match 3 of anything, except the bombs. Other levels, by the time all the explosions were finished, I was left with.....nothing. Level completed! The matching of 3 bombs, must be the match 3 game? This is only my opinion, though.